Another PowerShell report generating requirement: SharePoint Site Collection Permission Report to audit permissions on each and every object under a site collection. 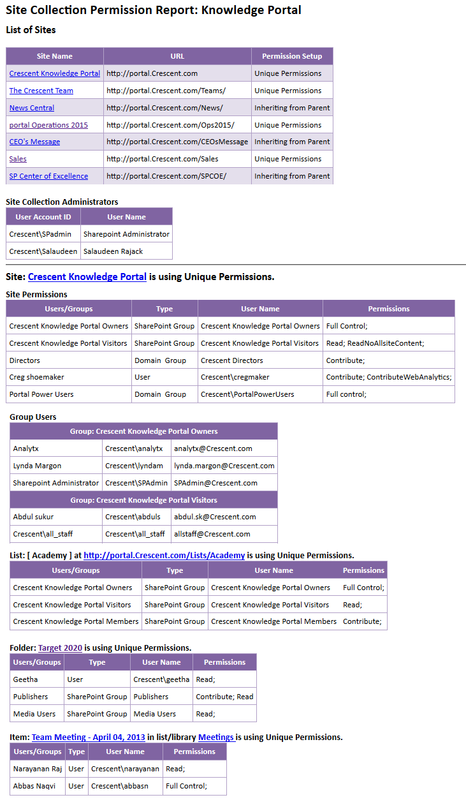 Permissions applied on each SharePoint object - Such as web (subsite), List, Folder and List Item. SharePoint Groups and members of each group who has access. How to run the script? 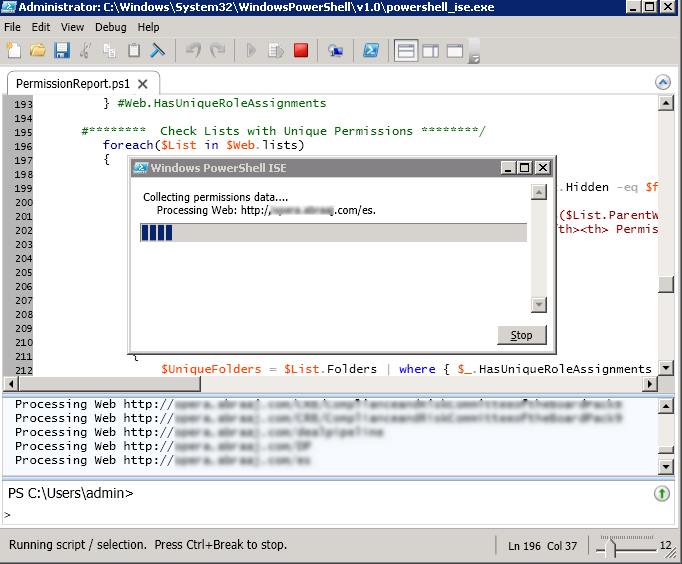 Well, Just copy-paste the given script below to either PowerShell ISE or notepad, save it something like "PermissionRpt.ps1", change the configuration variables such as "Site collection URL, Output Report, etc. accordingly. Save and Hit F5! #Exclude "Limited Access" - We don't need it sal. #**** Get User/Group Type ***** Is it a User or Group (SharePoint/AD)? #Is it a AD Domain Group? #Is it a SharePoint Group? write-host Site Collection with URL:$SiteCollectionURL Does not Exists! #Check if site is using Unique Permissions or Inheriting from its Parent Site! Script is included with a progress bar indicator. Once execution completed, it generates a HTM file at given location. You can optionally turn on Folders & Item Level flags to include them in permission reporting. If so, You can expect some delays in script execution! Here is a sample site collection permission report this script generated! This script doesn't count "Limited Permissions"! Thanks for your great post, its very helpfull. Besides im very weak on scripting like this. Anyway, im trying to modify it so i can get the report with only spesific user but no result. Do you have any idea how to generate report only for spesific user we want? Hi, thanks for sharing this. Is there a way to run this script for multiple site collection, can we import site collections from csv and generate a report ? Sure Vyas! Just call the function: Generate-PermissionRpt with all four parameters from the CSV file. Great Script Salaudeen. Is it possible to change HTML format to CSV format though? Any advice would be greatly appreciated. Method invocation failed because [System.String] doesn't contain a method named 'op_Division'. Is there a noob walk through for what fields I need to change to make this run? I am not a powershell person but I am doing my best to get through this. My new team has a complete garbage sharepoint site and I think this report will help get my supv on my side about the changes that need to be made. Just save this script with .ps1 extention. Change the $OutputReport and $SiteCollURL values accordingly, Right click the ps1 file you saved, choose "Run with PowerShell", Your report should be ready in few minutes. It will be great if we get this report in excel. Thanks Salaudeen Rajack. Great Work. I'm getting this error any help? I was glad to find this page as I am looking for a method to output SP permissions to a report. But after I edit the script appropriately and then run it, I get the following: Site Collection with URL: Does not Exists! I double checked the URL. Could my issue be that I'm running this against a SharePoint Online site? I was glad to find this page as I am looking for a method to output SP permissions to a report. But after I edit the script appropriately and then run it, I get the following: Site Collection with URL: Does not Exists! I double checked the URL to ensure it is correct. My Site Collection is a SharePoint Online/Office 365 site. That is, I'm not running SharePoint on prem. Does that make a difference? Yes! This script is written for On-Prem! this script is just awesome Salaudeen sir, u r a rockstar!